How many Kyusu do you own? And bonus question, how many do you use? So, 2 answers are permitted. Yixing Yixing Yixing! Begins to sound like a "Marcia Marcia Marcia" rant by Jan Brady. Yixing deservedly gets a lot of discussion on the forum, but according to several polls, many TCers really like their Japanese Kyusu-s as well. I figure it is time to create the unofficial/official Kyusu topic where we can share our Kyusu-s and discuss all things Kyusu! 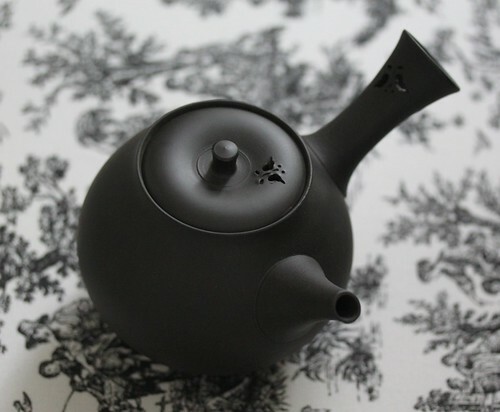 Remember, Kyusu is simply Japanese for teapot, so please share your Japanese teapots (and accompanying cups, wares ... etc). So be it Tokoname, Hagi, Bizen, Banko, Arita or whatever, please share with us. EDIT: So, this includes the typical perpendicular handle version but also other styles including the Houjin and similar facsimiles thereof. and have you chipped a spout? My Dens kyusu has developed some ominous cracks (so far visible only on the outside), and I'm now committed enough to regular sencha to be shopping for a prettier one like your gorgeous pot, one worth sharing here. 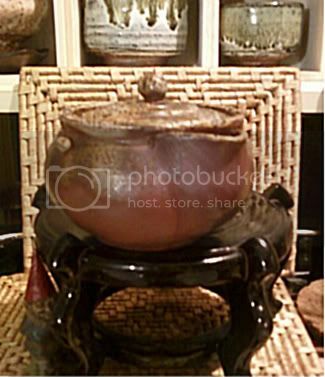 debunix wrote: My Dens kyusu has developed some ominous cracks (so far visible only on the outside), and I'm now committed enough to regular sencha to be shopping for a prettier one like your gorgeous pot, one worth sharing here. My White logo Den's Kyusu also developed some cracking early on, it has never progressed into anything worse! I still quite like it! But of course there are so many beautiful Kyusu available. The looking is half the fun. Thanks for sharing with us, Victoria and Iannon (I also like the Hagi and the Momiji canister!). Chip wrote: My White logo Den's Kyusu also developed some cracking early on, it has never progressed into anything worse! I still quite like it! Glad to hear that. I wasn't planning on putting it out to pasture for a good while yet. My only real reason for looking for another is that this one is not particularly beautiful. But it works beautifully. I think it has a great feel in the hand, but then I find the vast majority of Kyusu have excellent hand feel, probably partially due to the care in making them so perfectly balanced. Take for instance the "HANDle stand" they perform. Which brings to question, what makes for a great kyusu??? I have 8 typical side handled kyusu, and one glass. Of the 8 only four will stand on the handle, something that is interesting, but I would not use that feature. What I think makes for a good kyusu is usable size, good in hand feel and ease of cleaning. Of my 8, really only 3 get regular usage. Chip wrote: . Which brings to question, what makes for a great kyusu??? Balance, balance, balance. I have two in regular rotation--a mogake piece by Hokujo that fits like it was made for my hands and pours smooth as silk, and an amazing little kyusu by Gyokko that is much too small for my monkey paws but still has a beautiful sense of balance and flow that makes it work despite it's diminutive size. This Thread has so few images right now I thought I'd add a rather bad one but one none the less. I dare say this Hagi Kyusu is a BEAST! I did not fully realize the demensions when I bought it, but it holds probably in the range of 18-20 oz filled up to the top, as its basically two dens Shincha kyusus on top of each other. 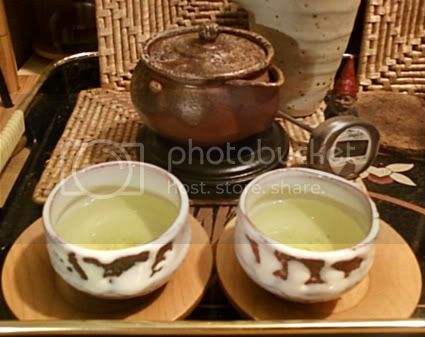 And due to the nature of the filter unless you want a tea salad, I can only really brew Asamushi sencha in it with the occasional Chumushi Sencha. This brings up another question: Can we post Hohin/hojins? in here too? Nice Adam, it is beautiful! It does seem most of the Hagi kyusu are large and the smaller sizes then being hohin. I had posted my favorite and most used Tokoname many times, so here is a different view. I love the large opening and the flat shape. I am a proud owner of my first kyusu. And all ready I am longing for another one. Do kyusus always have a (fine-meshed) filter? I bought mine over the internet. As it was my first one I did not want to pay very much (and as a student). But now I do not know if the Kyusu is lead free. Is there a way to get to this knowledge? I have heard that only the glacing can contain lead. Is that true? Welcome to the forum, Silje. 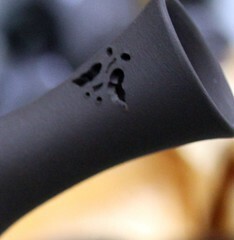 An authentic Japanese Kyusu should pose little threat of lead contamination. But you can alsways get a lead testing kit ... in the USA anyway, not sure where you are located. 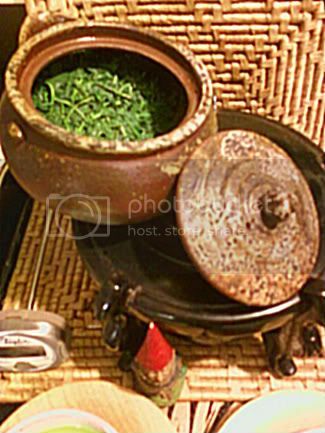 Thanks Adam and Victoria for posting your Kyusu-s.
Houjin, it is a specialized teapot or Kyusu for brewing "cooler tea" such as Gyokuro. This one is pretty old, around 50 years old, or so it was reported to be. It is Bizen. It is clearly Yohen ... "changed by the fire." It brews Gyokuro magnificently! 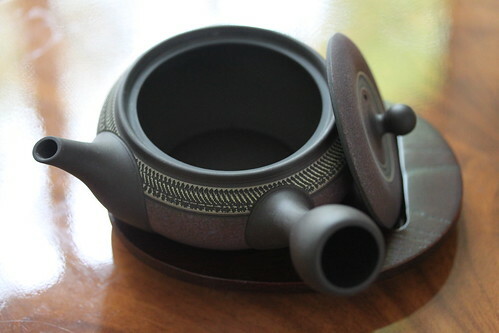 Guess Chip answered my question about hohin-s/hojin-s... so I have another photo to share, which I dare say is the piece of teaware I certainly love the most!